Whenever I think about chocolates my taste buds get active and my saliva starts rolling……. And I guess it’s the same with every one of us. From the time we start understanding our taste buds, chocolate is the most common food we crave for and this craving continues even as we age. People have different choices in chocolates such as milky, Cadbury, jelly, liquor-filled chocolates, dark chocolate, candies, bars etc., but in all these Dark Chocolate is the most nutritious. In 100 grams bar, it contains 50-70% cocoa and 11 grams of fibre. It also has plenty of iron, magnesium, copper, manganese, potassium, phosphorus, zinc and selenium. However, one should consume it in moderation. A study conducted by the University of California tested the theory that, as Dark Chocolate is believed to increase your metabolism; these benefits may cancel out the calories consumed. It may not be an obvious food choice for dieters, but research findings suggest that eating dark chocolate in moderation could actually keep you slim. Adults who consumed dark chocolate frequently had a lower BMI (Basal Metabolic Index) than those who didn’t, despite them often eating more calories and not exercising more. Like tea, dark chocolate contains flavonoids, which are compounds that act as antioxidants. Dark chocolate has the type of fat in chocolate may actually increase the good HDL (high-density lipoprotein) cholesterol and will not increase the bad LDL (low-density lipoprotein) cholesterol in the blood. Dark Chocolate is our hearts Best Friend. Yes!!! You heard it right our Hearts best friend. A recent Harvard study concluded that eating dark chocolate may have a reduced benefit on blood pressure. This is likely due to the flavanols found in chocolate that contain at least 50 to 70% cocoa, which appear to result in mild blood vessel dilation. Compounds called phenols are present in cocoa-rich chocolate. These antioxidants are the same as the ones found in red wines. 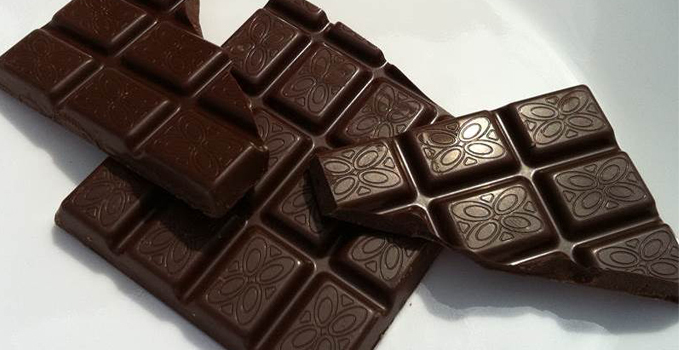 Dark chocolate is rich in brain-boosting chemicals when you have got a tough exam coming up? Boost your IQ and indulge your taste buds at the same time by snacking on a few squares of chocolate which will help you to improve blood flow to the brain as well as improving their ability to form new memories. Dark Chocolate not only offers many amazing health benefits, it is also a great pick-me-up snack so can help you stay energized for your workouts. It is high in energy-boosting chemicals including theobromine (a stimulant found in many popular energy drinks) and caffeine. Have 1-2 squares of chocolate in the afternoon or before a workout to help stay energized for a longer period of time. Skin is the most sensitive organ of our body, the skin creams are great for keeping our skin looking more youthful, they can only do so much; to really keep the wrinkles at bay, you need to look to your diet. Research has suggested that, when it comes to fighting free-radicals, dark chocolate could be even healthier than fruit! When tested and compared to juices from ‘superfruits’ such as blueberries and pomegranate, dark chocolate was found to be higher in antioxidants. Dark Chocolate is known to be high in mood-boosting chemicals and findings published in the scientific journal Nutritional Neuroscience have suggested that the food can even help reduce the symptoms of depression. As we talk about the taste buds when the taste buds are stimulated with pleasurable flavours, there are endorphins released in the brain. These endorphins are the feel-good compounds of the body. Chocolate contains chemicals that cause the brain to release compounds that trigger the ‘feeling of love’. In moderation, if you consume 2 squares of dark chocolate every day you can continue to be healthy as well as fit for a long period of time. “Note to self- Eat lots of Chocolate when times get rough and eat even more when times are great.” So always keep a smile on your face, a rainbow in your heart and some dark chocolate on hand! To make healthy lifestyle choices click here.